Enter Our Stock Market Contest and Win $500! The results of our “guess what the Stock Market will close at on the day after the election” contest are in! We had almost 150 entries (I’m surprised there weren’t more – it was an easy way to win up to $500!). Bill Liebler – who was within about 12 points of where the Dow closed – won a $250 Amazon Gift Certificate. I interviewed Bill in my New York Times best-selling book in chapters 7 and 10. Among other things, Bill uses Bank On Yourself to fund his daughter’s college education. To learn more about why Bill thinks Bank On Yourself beats using a 529 plan, UGMA or other government sponsored plan, check out this article and video. And Jim Vana was the other winner of a $250 Amazon Gift Certificate for coming the closest (within 1 1/2 points) of where the S&P 500 closed. 1. Post your guess of what the Dow and/or S&P will close at, on Wednesday, November 7, the day after the election, in the comments box below. 2. The person who comes closest to guessing where the Dow actually closes will win a $250.00 Amazon.com Gift Certificate, and the person who comes closest to guessing where the S&P 500 closes will win a $250.00 Amazon.com Gift Certificate. You can take a guess on both indexes and win $500.00 if both of your entries come closest. 4. Only one entry per person is allowed and be sure to include a correct email address, so we can send your Gift Certificate to you if you win (your email address will not be published). Note: We’d also love to hear if you’re in the stock market or out of it now – and why – so feel free to add a comment about that when you post your entry in the comments box below, along with your guess for what the Dow and/or S&P 500 will close at on Wednesday, November 7. Please note that all comments are moderated, which means there will be some delay before your entry/comment appears. Are you tired of playing guessing games when growing your nest egg? 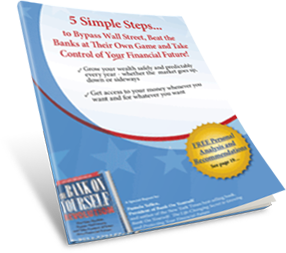 Keep in mind that Bank On Yourself is based on an asset that has grown by a guaranteed and predictable amount for more than 160 years – no matter what was happening in the stock and real estate markets. The growth is much greater then you can get today in a CD, money market account or annuity – but without the risk of stocks, real estate, gold, commodities and other volatile investments. So if you want to stop rolling the dice on your financial future and find out what the guaranteed value of a plan custom tailored for you would be on the day you want to tap into it – and at every point along the way – request your FREE Analysis now to find out! Dow Jones will be:12785.61 and the S&P will be at 1324.50. Obama to lose and stocks down. Post election. Dow 13,672, SP 1472, with all the turmoil I mostly out of the market. NOTE: I’m still in the stock market, but mostly out of the US dollar – holding very little in the US. I’m thinking about completely liquidating everything, but the “tax hit” is steep. If the market peaks and my portfolio recovers somewhat, then I may revisit the liquidation idea. A lot will depend on who gets elected. Not sure by the contest if it is the day after election close or opening of that next day, but assuming it is day after election close. If R/R win, then I’m probably low, if BO/JB win, then I think mine is correct. I’ve been of the belief that BO will get reelected since so many polls don’t factor in Gary Johnson and I think the Libertarians will get 10-15% of the vote, question is will it be taking from R/R or will it be split given how many young folks that voted for BO are disillusioned by his policies and lack of jobs. Hope I win – $500 would go a long ways for Christmas shopping!! 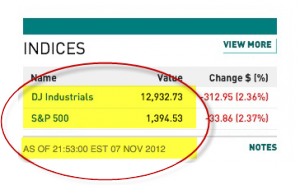 On wednesday November 7, 2012; after the election, my guess is that the Dow will close at 13,785 and the S&P will close at: 1,473. I am currently in the stock market because my company who I work for had an employee stock purchase plan and a 401k. I had both company stock and 401k plan. I currently putting about 10% to 15% of my income into the stock market and 30% to 40% of my income into a whole life insurance. No savings ,money market, and CD. DOW will be 14,150 at close of November 7, 2012 trading session. S&P will be at 1,878 at close of trading on November 7, 2012. The DOW will close at 13,820.50 on November 7th the day after the presidental election. My guess is that Dow will close at 12,750 on Nov 7th, 2012. Pamela, I submit the DOW will slip below 10,000 the day after the US presidential election. Due to the unfortunate occurrence of citizen majority re-election of our current leader? This is positive thinking of Romney being elected and thinking they will bounce up with a brighter outlook. With the advise of my new Bank on Yourself adviser, I moved my existing 401K funds out of the mutual funds and into a bond fund. When a friend of mine mentioned the 205 point drop in the Dow on Friday i just smiled. Not to worry. The Dow will close at 14984 and the S&P will close at 1522. 1. If a retired person transfers their traditional ira to a roth ira and they do not have a roth ira, but are over 59 1/2, do they have to wait 5 years to access their tax-free gains from that ? 2. If someone can not have a roth ira because of their high income, so they do a non-deductible ira instead, can they then transfer this ira to a roth ira and wait 5 years and age 59 1/2 before they access the tax-free gains? Ok Romney is the one! The Dow will close at 14015 and the S&P will close at 1412. The Dow will close at 13253. … to cover both good and bad news of election results. S & P will be 1,506. Obama wins, Dow down to 12,850 (gold up $75), S&P close at 1,350. i have stopped participating in the market…no need to! Dow will close at 13,752 and S&P will close at 1473. How about Dow closing at 12794 and the S&P at 1357. Pamela – thanks for running context- my guess was based on a couple of factors – continued slow down in Europe, fiscal cliff scaring folks, risk of taxes going way up on capital gains, and that I thought Obama would be reelected. I hate being right about that last item, but hey I won $250!! !